The year 2016 started with a bold experiment by the Delhi government, which for 15 days allowed only cars with licence plates ending in odd and even numbers to ply on the roads on alternate days. The aim of the odd-even scheme, which spared women drivers and two-wheelers, among others, was to curb pollution. To what extent it succeeded has been questioned; some critics say the contribution of vehicular emissions to pollution in the capital is exaggerated. 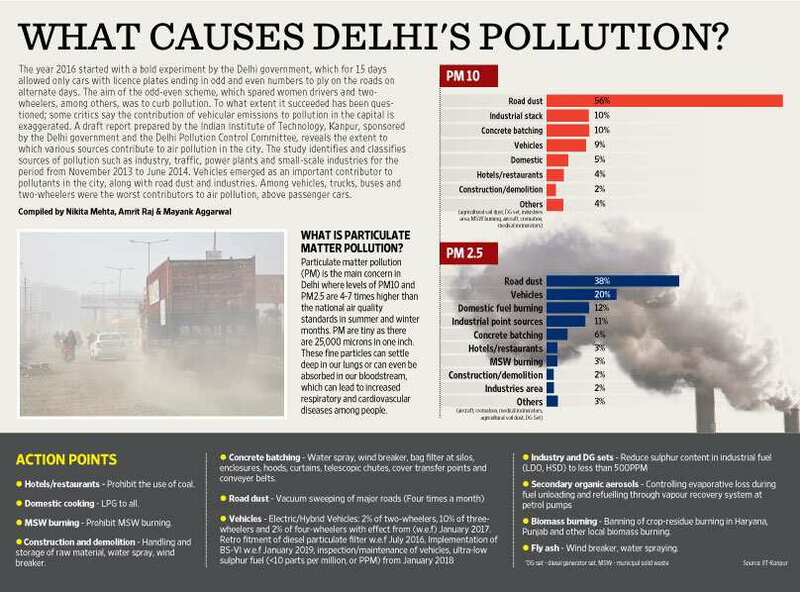 A draft report prepared by the Indian Institute of Technology-Kanpur, sponsored by the Delhi government and the Delhi Pollution Control Committee, reveals the extent to which various sources contribute to air pollution in the city. The study identifies and classifies sources of pollution such as industry, traffic, power plants and small-scale industries for the period from November 2013 to June 2014. Vehicles emerged as an important contributor to pollutants in the city, along with road dust and industries. Among vehicles, trucks, buses and two-wheelers were the worst contributors to air pollution, above passenger cars.